My kids are artists, they love to sing, dance and their drawings are the best. They joined contest and won a lot of awards for being creative. The month of October has been celebrated as the National Children's Month since 1993. During this time, both government and non-government organizations give focus to Filipino children in recognition of their vital role in the community and in nation building. Joining this celebration, the Philippine Educational Theater Association (PETA) will have a limited run of its longest-running musical production for children and young people, Christine Bellen's based on Severino Reyes' Mga Kuwento ni Lola Basyang. When I received an invite from the Philippine Educational Theater Association (PETA), I scheduled my kids right away, I know the story and heard about Lola Basyang when I was at their age and I wouldn't miss this thing for them. They are Filipino Americans but surely, a story from my youth from my native land will interest them too. Also, they love musical plays, when they were still in my tummy, I watched Les Miserables, Miss Saigon and Chicago at Broadway and sing the songs to them. Mga Kuwento ni Lola Basyang includes; Ang Prinsipeng Mahaba ang Ilong, Ang Binibining Tumalo sa Mahal na Datu, plus a new story, Ang Mahiwagang Kuba. Ang Prinsipeng Mahaba ang Ilong (The Prince with a Long Nose) grew up thinking that he looked normal until he first stepped out of their castle. Ang Binibining Tumalo sa Mahal na Datu (The Lady who Defeated a King) introduces Sharay, a servant's daughter from Tondo who surpassed the King's three challenges to make herself worthy of the prince. Ang Mahiwagang Kuba (The Magical Hunchback) tells the tale of Prince Jorge, who was cursed to be a hunchback separated from his family. To reverse this curse, all he needs is a lady's kiss. 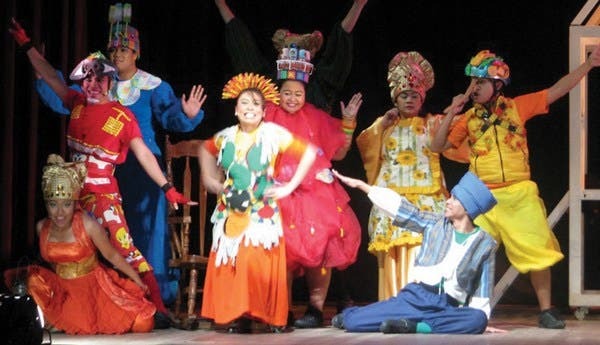 Mga Kuwento ni Lola Basyang is highly praised for its playful costumes and set design. Costume designers Ron Alfonso and Boni Juan used household items like spoons, laundry clips, puzzle tiles and hand-sewn rags to adorn the characters. The set design by Mel Bernardo is similarly inventive, as it folds, unfolds, rolls on wheel, and uses ladders, slides, platforms and boxes. Director Phil Noble allows his actors to jump and slide through the set that transforms from castle to house, or even a river. Noble's direction can easily be dismissed as complex, but his love for drama and movement expels a youthful energy to the entire performance. He draws inspiration from the circus performances he watched during fiestas in his hometown Taal, Batangas. Mga Kuwento ni Lola Basyang also features music by Noel Cabangon and Bob Aves. The play runs from September 27-29, October 4-6, 11-13, 10:00 A.M. & 3:00 P.M. at The PETA Theater Center. Tickets are sold at Php600 (regular) and Php800 (VIP). For details, call 725-6244, 0917-5765400, or petatheater@gmail.com.